Most inflatable hot tubs are only meant to be used in temperatures above 40F. This means for most of us that we need to pack away our inflatable hot tub before Winter comes blowing in. 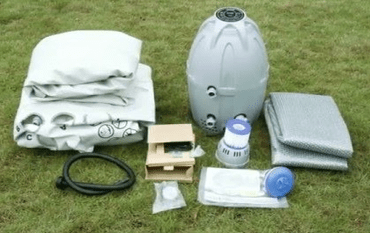 In this article, we’re going to give you a step-by-step guide as to how to take down your inflatable hot tub and pack it away in perfect condition. Following our guidelines means that your hot tub will then be as good as new when you take it out in the Spring, all ready for another hot tub season. Please note this is a general guide, one which will work for most inflatable hot tubs. Your particular model might be a little different, so if a step seems unfamiliar, please refer to your owner’s manual or dvd. We suggest you take down your inflatable hot tub on a warm sunny day, as this will help with drying the hot tub before you fold it up and pack it away. Switch off the power at the socket and unplug your inflatable hot tub power cord. Place the power cord away, so it isn’t lying close to the hot tub, otherwise it might get wet when you empty out the water. Locate the filter housing, which will usually be on the inside wall of the hot tub near the pump. Unscrew or undo the filter housing and remove it from the hot tub. Then put the stopper plugs into the now-empty valves, where you have just taken the filter housing from, in the hot tub wall. Now you need to disconnect the motor unit and the hot tub. Unscrew the couplings which join the motor to the hot tub and carefully carry the motor unit away from the hot tub. Before you tackle the hot tub, you’re going to clean and dry both the motor unit and the filter. Take your garden hose and place it into the water inlet valve on the motor unit. Turn on the water and leave the water running through the motor unit for a few minutes. You’ll probably see that some calcium build-up gets flushed out in the water. Keep the water running until it runs clear. Now tilt the motor unit a little and give it a gentle shake, to get out any remaining water. Use a cloth to dry the motor and then leave it to dry fully in the sunshine. Don’t put the motor unit away yet, though, as you are going to use it to help dry out the hot tub – and to deflate it. Next, turn your attention to the filter housing. Undo the housing cover and take out the filter cartridge. Unless the filter cartridge has only been in for a day or two, it’s probably best to discard the filter cartridge and start with a brand new one next Spring. 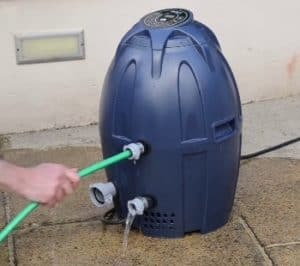 Using your garden hose, flush out the filter housing until the water runs clear, and then dry it thoroughly using a dry cloth. The next step is to drain your inflatable hot tub. Locate the drainage valve on the outside hot tub wall (refer to your owner’s manual if you’re not sure). You will need to attach a garden hose to this valve, for easy drainage. There should be an adaptor which allows you to screw the hose onto the valve. If your hot tub didn’t come with a garden hose adaptor, then you can buy one cheaply on Amazon or directly from your inflatable hot tub manufacturer. Please be careful where you drain the water. Your inflatable hot tub water has strong chemicals in it – the chlorine or bromine which you use to sanitize the water. These chemicals can kill flowers and plants, and they will also discolour and harm grass. Also, if any chemically-treated water is left in a pool on the ground, there’s a chance that family pets or birds might drink it, which could be extremely dangerous for them. So make sure you place the end of the garden hose into a suitable drain, so the water drains safely way without harming any flora or fauna. When the hose is screwed onto the drainage valve, undo the drain stopper valve and the water will come flowing out through the hose. When your hot tub is empty of water, and before you go any further, give your inflatable hot tub a thorough clean, to get rid of any chemical residue. Remember to clean your inflatable hot tub cover as well – especially the underside which has been directly over the hot water, as this will almost certainly be covered in chemical residue and water marks. Check out our article How To Clean Your Inflatable Hot Tub for thorough advice on cleaning every part of your hot tub (opens in a new tab). This is a vital step! If you put your inflatable hot tub away for the Winter while there is any water or moisture in it, then it will probably grow mold over the Winter months. This will stain and could even destroy your hot tub liner. So make sure your portable hot tub is thoroughly dry before you fold it up and put it away. You’ll find that most of the water will drain out of your hot tub through the garden hose. If any remains, carefully lift up the hot tub so that the water runs down towards the drain valve. If your hot tub has a drain valve in the floor, then get someone to help you carry the hot tub over to the drain. When the hot tub is in the right position, undo the drain valve so the water pours out down the drain. Take great care not to strain your back. That pool of water in the bottom of your inflatable hot tub might still be heavy! So don’t lift the hot tub on your own if you’re not sure – always get help. Now thoroughly dry the inside and outside of your inflatable spa using a sponge and several dry cloths, such as old towels. Top Tip: You can use the massage blower to help dry any remaining droplets of moisture. Attach the motor unit, put the cover on your hot tub and turn on the massage system for 30 seconds. Then turn it off and take the cover off. Now turn the massage system back on for another 30 seconds. This will also clear any droplets of water which might have lodged in the air bubble jet holes. It also clears any water that is left in the motor unit, saving you a lot of work! We strongly recommend you thoroughly dry your inflatable hot tub before you deflate it. That’s because when it’s deflated, it creases up and it becomes harder to check if any of those creases are damp or have drops of water in the folds. With the motor unit in place, attach the inflation hose and then press the deflate button on your digital panel. The hot tub will deflate in seconds (see the video at the bottom of the page). When it is fully deflated, uncouple the inflation hose and unplug the motor unit. You may find that your inflatable hot tub motor unit doesn’t have a deflate button. In which case you need to remove the inflator valve and press down on the hot tub so that the air comes out of the valve – the way you might have done in the past with an airbed (only the hot tub will take longer!). When the hot tub is fully deflated, turn it over and spread it out on a dry flat area. Now wipe the base over with a damp cloth, to remove any grass stains or marks. Once you have finished, thoroughly dry the base, either with an absorbent cloth or by leaving it in the sunshine. Remember to thoroughly clean your inflatable hot tub cover as well, especially the underside which has been exposed to the steam from the hot water. Make sure all chemical residue and water marks are cleaned off. Then dry the cover thoroughly with a cloth or – once again – in the sunshine. Repeat this cleaning and drying for any other parts which came with your inflatable hot tub, such as a floating thermal blanket or insulated ground sheet. The key is to make sure that every part is clean and dry before you pack them away. First off, check that all the removable fixtures and fittings, including the valves and couplings, are removed from your hot tub. Put these in a separate ziplock bag or sealable box. You should never put your inflatable hot tub into storage with any of the fixtures and fittings still in place, as they could damage the vinyl liner when you fold the hot tub away. When your inflatable hot tub is dry, lay it out on a flat dry surface and sprinkle some talcum powder over the hot tub vinyl. Now fold the hot tub up, working from the side furthest away from the open air valve. Press the folds down as you work, to squeeze any remaining air out of the hot tub. When your hot tub is flat and folded, you may want to try and put it back into the original box, if you kept it. Remember, however, your inflatable hot tub was folded and packed by machines in a factory, so you might find it difficult to get back into the box. If that’s the case, it’s fine to wrap it in a large tarpaulin and tie it with twine or rope. Just make sure the tarpaulin is as airtight as possible around the hot tub. However you decide to pack away your inflatable hot tub, it’s a good idea to store it off the ground in your garage or storage room. You can place it on a wooden pallet or on a sturdy shelf. Remember, though, that your inflatable hot tub can weigh between 50 and 100lbs, so you might need help carrying it and putting it away. Please keep in mind the need to always bend your knees when lifting any heavy load and to protect your back from injury. We hope you find this guide useful. We were surprised to see that there is such little help on the internet for inflatable hot tub owners, as to how to pack away their hot tub. So hopefully this has filled a gap! If you have any queries, please write in via our Contact Page. Thanks for reading!